Above: Beautiful Model Edita Vilkeviciute Modeling For The Cover Of H&M Photographed By Camilla Akrans. Edita Vilkeviciute is a Lithuanian model who had her high fashion runway debut for Just Cavalli for the spring / summer 2007 fashion shows shortly after being discovered. Edita Vilkeviciute later walked for Paul Smith, Preen, and Marios Schwab in London. Following her initial successes, Edita Vilkeviciute then continued her high fashion modeling career by walking for Balenciaga, Chanel, and Louis Vuitton. In late 2008, she participated in the Victoria's Secret Fashion Show in the PINK section. Thus, Edita Vilkeviciute is one of the hottest girls on the runway these days, and the following video shows her modeling at the Milan Fashion Week Spring / Summer 2011 fashion shows. The following year, during the spring / summer 2009 season, Edita Vilkeviciute walked over 35 runway shows for some of the world's top designers, including Chanel, Stella McCartney, and Givenchy. Edita Vilkeviciute then participated again in the 2009 Victoria's Secret Fashion Show in two sections: the "All Aboard" and "Enchanted Forest" sections. She also participed in the 2010 Victoria's Secret Fashion Show in the segments "Country Girls" (where she wore 'Angel' wings for the first time) as well as "PINK Planet". The following video allows you to see Victoria's Secret model Edita Vilkeviciute modeling on the high fashion runways of the world. Get to know a little more about this stunning Lithuanian beauty and see her backstage at Pucci as her makeup artist prepares her all natural and beautiful look! 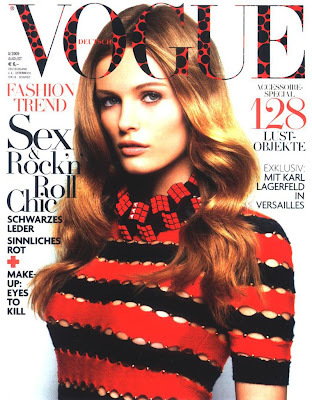 Above: Beautiful Model Edita Vilkeviciute Modeling For The Cover Of Vogue Germany Photographed By Greg Kadel For Vogue Germany High Fashion Editorials.